We always want to know the intention of someone’s actions. 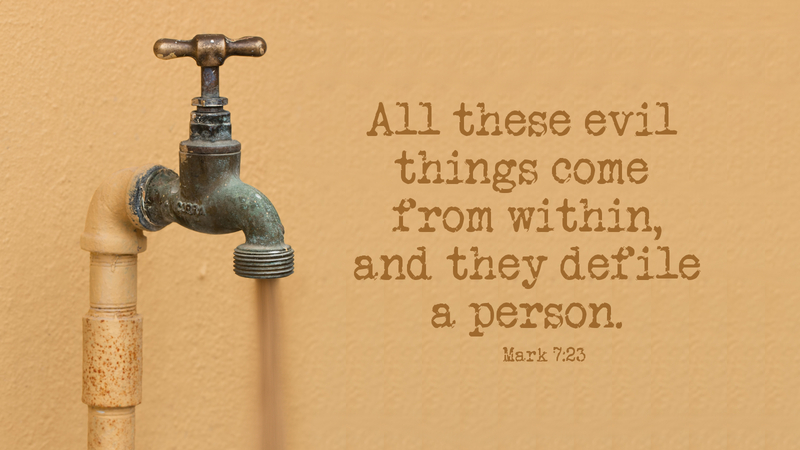 In today’s Scripture from Mark, the religious leaders were questioning the actions of Jesus’ disciples. The tradition of outward ritual cleanliness was the issue in their eyes. Jesus replied to their nit-picking about external appearance by zeroing in on their real need: to know the intention of their souls. What comes out of your mouth and my mouth originates from within the heart, our innermost self. Jesus is concerned with what comes from our heart because it is regulated by our free will. The gate of our innermost self is our free will. What we let in and what we let out. In this day when so much of what we let in is from television and digital media as well as internet connections, it is more important than ever to guard the soul from the influence of a broken and evil world. What comes out of a Christian needs to be the honest truth, the best of integrity, the purest of thoughts, and the epitome of humility. Our spiritual intentions are shown by how we conduct ourselves. Let your life reflect Christ Jesus and his love. Prayer: Come into my heart, Lord Jesus, and build in me a clean and true heart. Amen. Even today, so many traditions are held on to by many churches and churchgoers. It is just what we have learned from one generation to the next. True Muslims still hold to the old laws of “Father Abraham” especially with rituals of cleansing. We are not to live by rituals like the Pharisees, but by God’s grace.